A few days ago I had the golden opportunity to accompany Marc J. Christiansen and Johannes Schlörb from fuenfkommasechs.de. 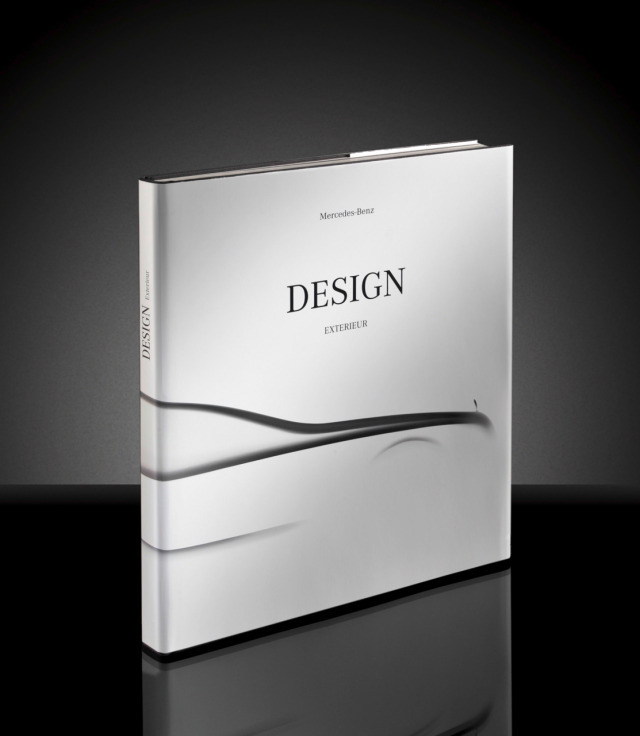 If you are intersted in Mercedes-Benz design, you'll love "Mercedes-Benz DESIGN Exterieur". 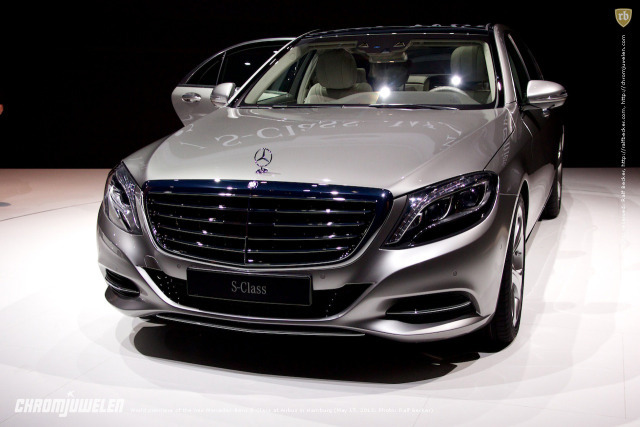 Of course — the new S-Class is the focus. But in another large chapter the book's authors devote themselves to the history of Mercedes-Benz design. Btw, the illustrated book published on the occasion of the world premiere of the new S-Class is recipient of the coveted red dot award: communication design 2013. 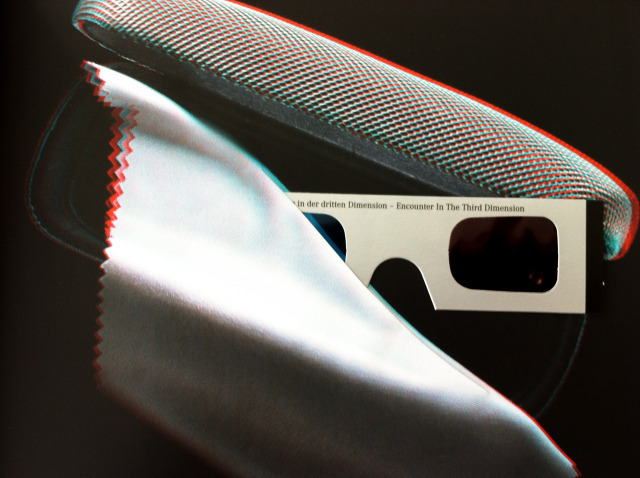 The illustrated book is available in the Mercedes-Benz Museum Shop or from ISS DEBEOS STUDIOS (German and English; EUR 98,– (plus shipping charges)). 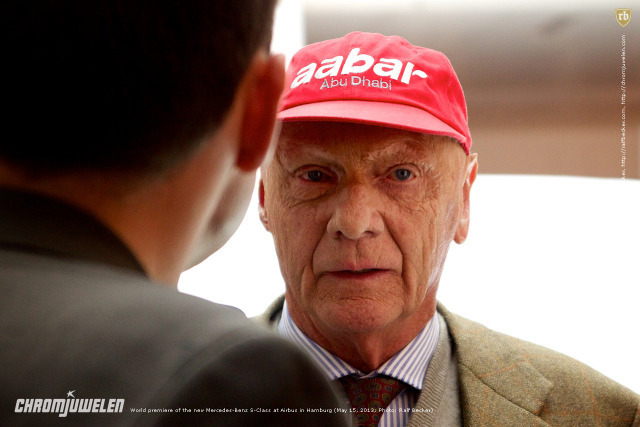 Congratulation, Mercedes-Benz — and many thanks for sending over the book! "Hamburg, May 15, 2013. This evening, the new flagship for luxurious motoring landed in Hamburg on board an Airbus A300-600 DHL cargo plane. 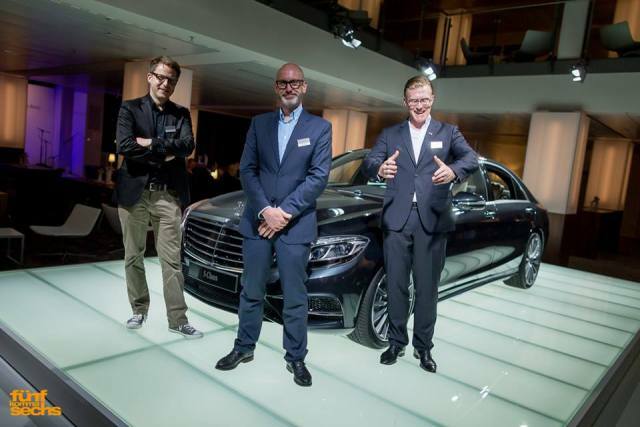 Mercedes-Benz had the new S-Class flown in exclusively from its birthplace in Stuttgart for its world premiere at Airbus in Finkenwerder. At the delivery centre for the Airbus A380, the world's largest passenger aircraft and a benchmark in travel comfort, Mercedes-Benz unveiled its new luxury saloon in front of around 750 international guests from the worlds of politics, industry and media. 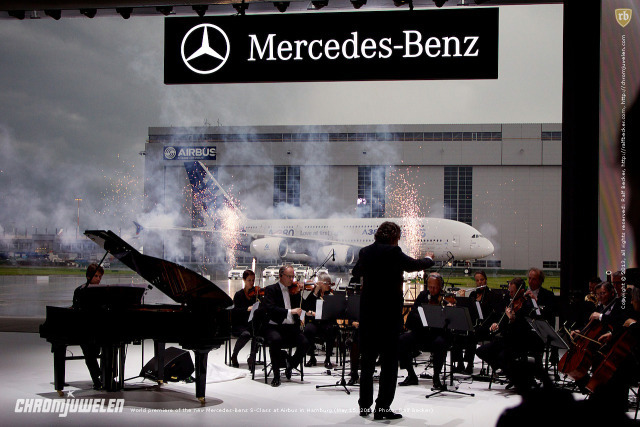 Flanked by the 20 current Mercedes-Benz models and musically accompanied by the Hamburg Symphony Orchestra, the new top-of-the-line model from Stuttgart rolled across the tarmac as part of a spectacular show. In a dazzling display, it took up its position at the head of the Mercedes-Benz family and drove onto the stage with its first passenger, the global superstar Alicia Keys." Even after a couple of days, it's hard to find the right words. Although I am personally not a fan of high tech stuffed cars, the new S-Class with it's three engineering priorities "Intelligent Drive", "Efficient Technology" and "Essence of Luxury", extends the boundaries of technology on many levels. 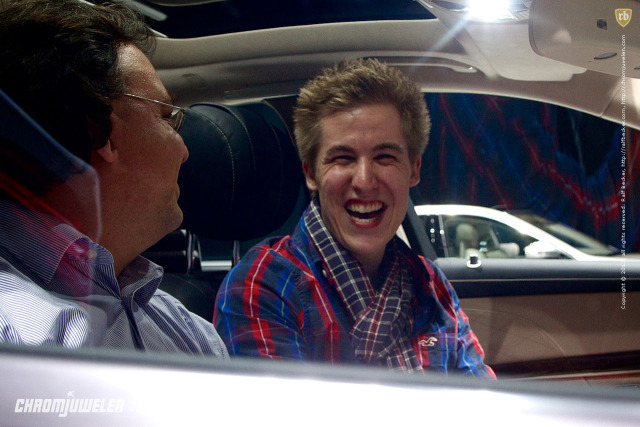 Not to mention the fact Mercedes-Benz threw a mind-blowing party. Five German star-rated chefs specialising in different culinary styles each cooked their own dish, Alicia Keys had come specially to Hamburg just a few days ahead of the start of her European tour. And with 19 musicians under conductor Prof. Johannes Schild, the Hamburg Symphony Orchestra played various pieces that had been specially composed for the world premiere of the S-Class by the internationally successful film composer Marius Ruhland.